hot peppers (in the form of the ever-delicious ají amarillo/mirasol). 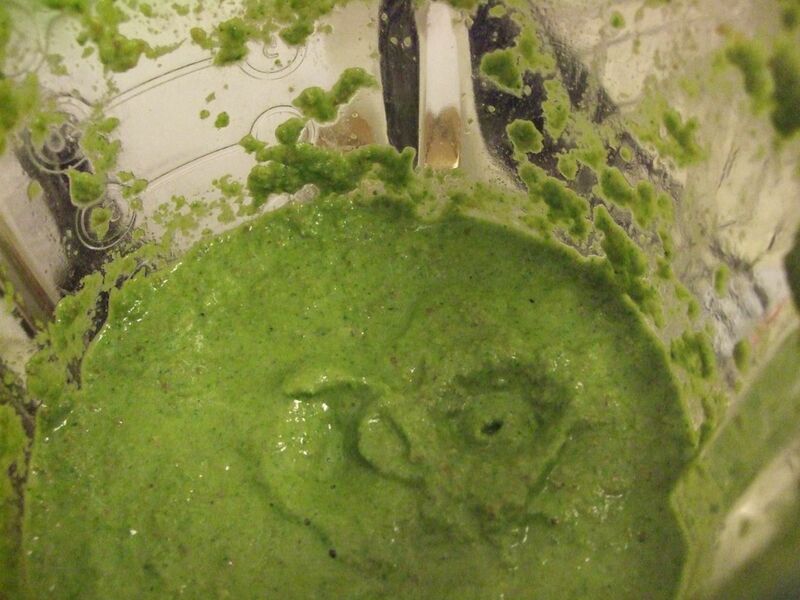 The sauce is traditionally used as a condiment for grilled meats, but it can also be used sort of like a pesto, for dressing pasta. Similarly, since it has a fair bit of vinegar and oil, it can be used to marinate meats before grilling. You can also whip a small amount into sour cream or cream cheese or plain yogurt to create a tangy dip. It can go on anything, really. When I was growing up, we used to use chimichurri like ketchup; in fact, my mother used to use empty Heinz ketchup squeeze-bottles to store her batches of chimichurri. This was one of the first recipes I perfected when I moved out of the family home. This version of chimichurri sits somewhere between a French persillade and an Italian pesto, using a ton of fresh cilantro instead of parsley or basil. 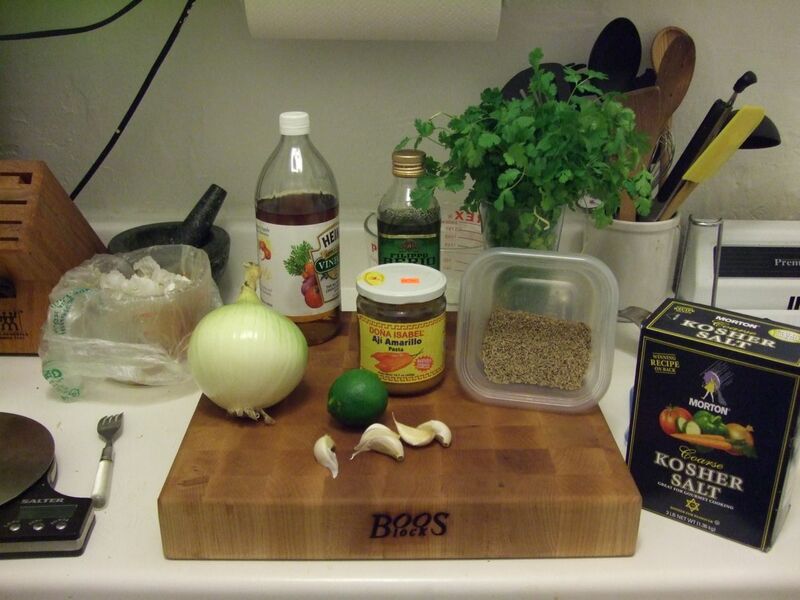 The main ingredient-categories are fresh leafy herbs (cilantro), oil, vinegar, hot peppers, and cumin. Usually a small onion is also thrown in to give the sauce some texture, although the herbs will also thicken the sauce as you blend everything together. It’s important that you get enough vinegar into the condiment to make it very tangy; this is what helps make the sauce shelf-stable, so that you can keep it for months without spoiling. The high acidity is also what makes it so good as a marinade. The cilantro absolutely MUST be fresh and plentiful! Pretty much every other ingredient is either dry, non-perishable, or relatively long-lasting, but cilantro is famously quick to wilt. 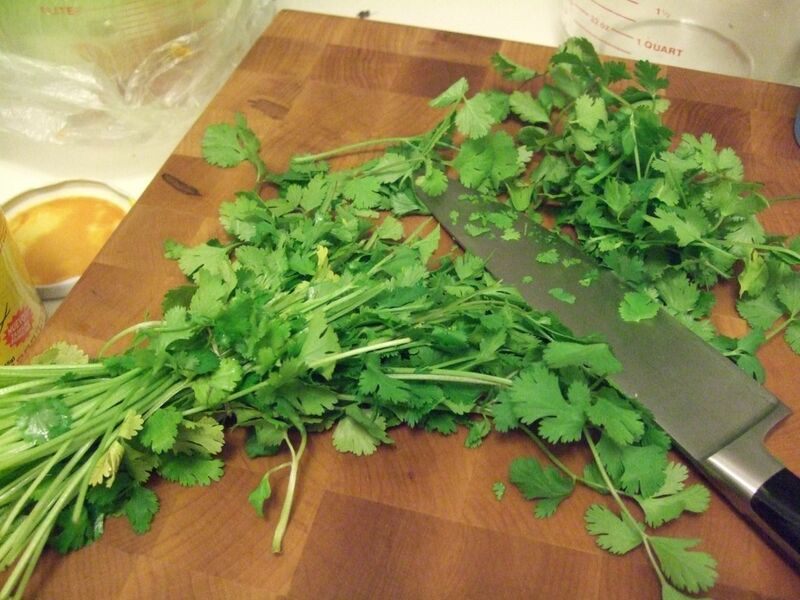 If you can’t buy cilantro the same day as you’re going to use it, cut the bottoms off of the stems and then put the whole bunch of cilantro in a tall glass with 3-4 cm of water. Also, you can control the spice level by including or excluding the seeds and membranes of the hot peppers. Never use the stem (duh). AJI AMARILLO is a rather important ingredient in most Peruvian cooking, and it’s also crucial to this chimichurri recipe. If you don’t have easy access to the peppers (fresh whole, frozen, or as a paste), check the local Latin-American importers in your city. In Europe, it is often the Spanish/Portuguese importers that also carry Peruvian pepper pastes. See my Papas con maní recipe and my Ocopa recipe for more tips on how to find and/or substitute for ají amarillo. stand/jug-blenders are ideal for getting a smooth consistency here, but you can also get a pleasingly chunky consistency with a hand-blender. Everything and anything! Primarily used as a condiment for grilled meats, but you can add it to dips, put it on noodles, marinate meat with it, throw in a pot of rice, or add it to sautéed vegetables (although it will lose its green color when exposed to high heat). 1. If you’re making TurboChimi, prepare your hot peppers first and blend them to a paste. Leave them in the blender and continue. 2. Peel and quarter the onion. Place in blender with a bit of oil and vinegar (not too much, you can add more later). Blend to a chunky paste. 3. 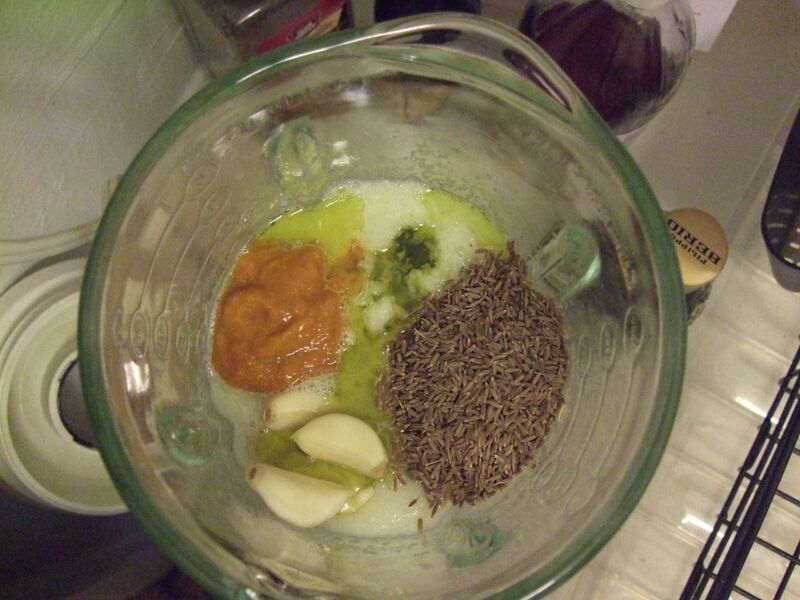 Add cumin, peeled garlic cloves, ají amarillo, and the rest of the spices to taste. (Don’t fuss with the flavor too much at this point, see step #6). Blend until completely mixed. 4. 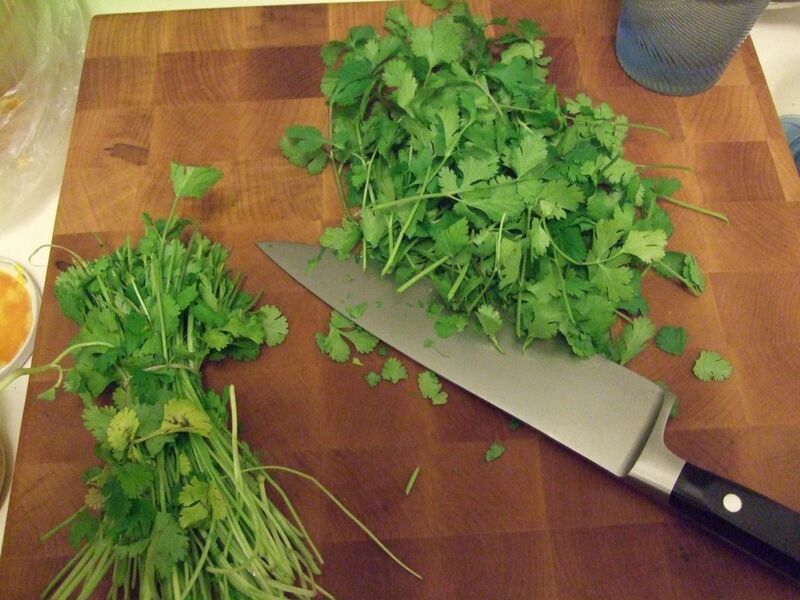 WASH and de-stem cilantro, then throw into blender. 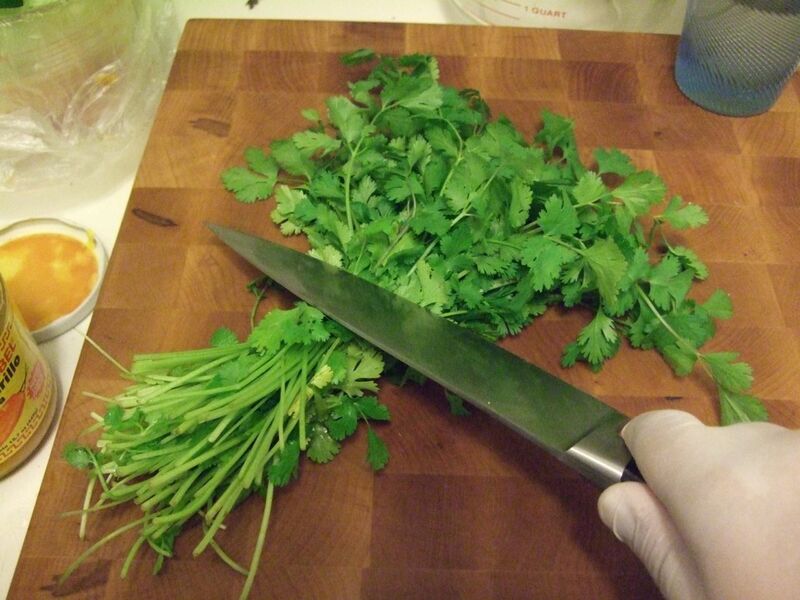 A few stems won’t hurt; just run a very sharp knife along the stems and away from you, and you should end up with mostly leaves. Blend. 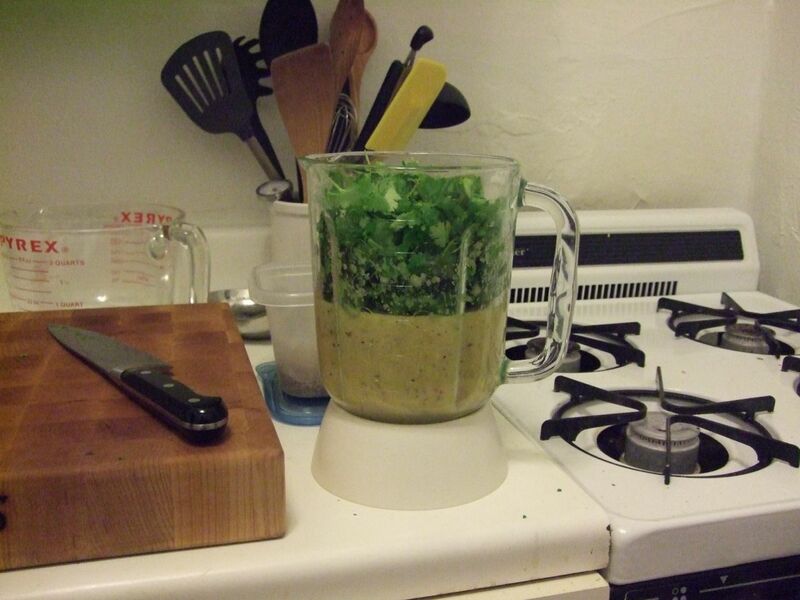 You may need to do this in batches, since you have a lot of leafy cilantro to fit into that blender. 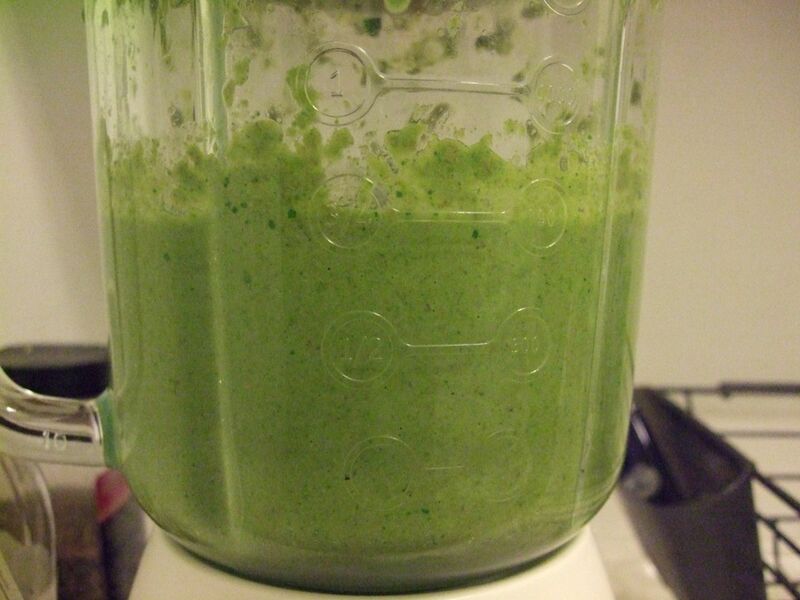 You’ll be surprised at how much actually goes in there, once it’s been blended. 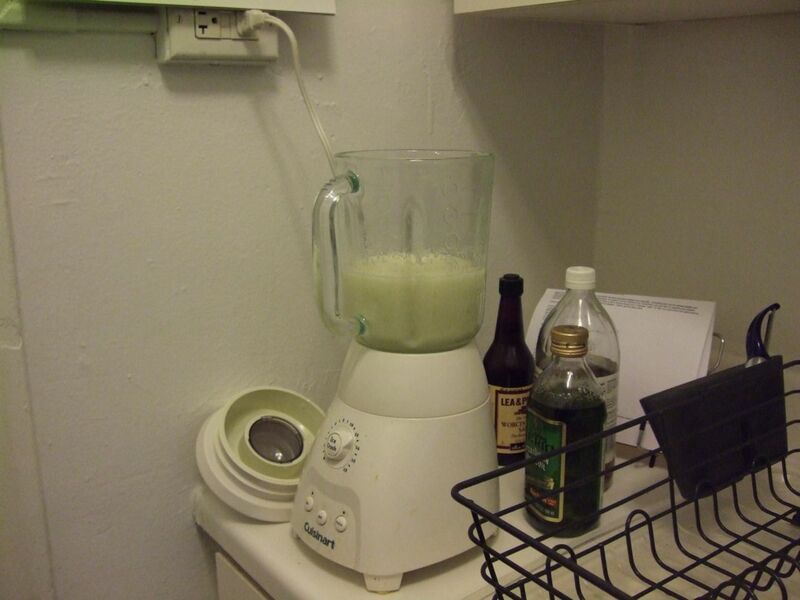 Avoid the temptation to stick a spatula in there to push down the leaves while the blender is running. Trust me. 5. 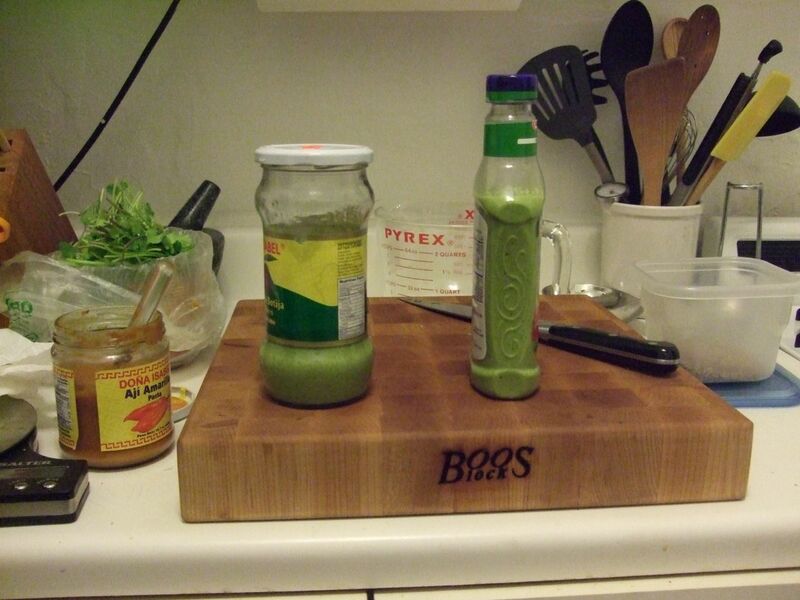 Blend to a ketchup-like paste, thinning if necessary with vinegar and oil. Keep in mind that the sauce will thicken a bit during storage. 6. 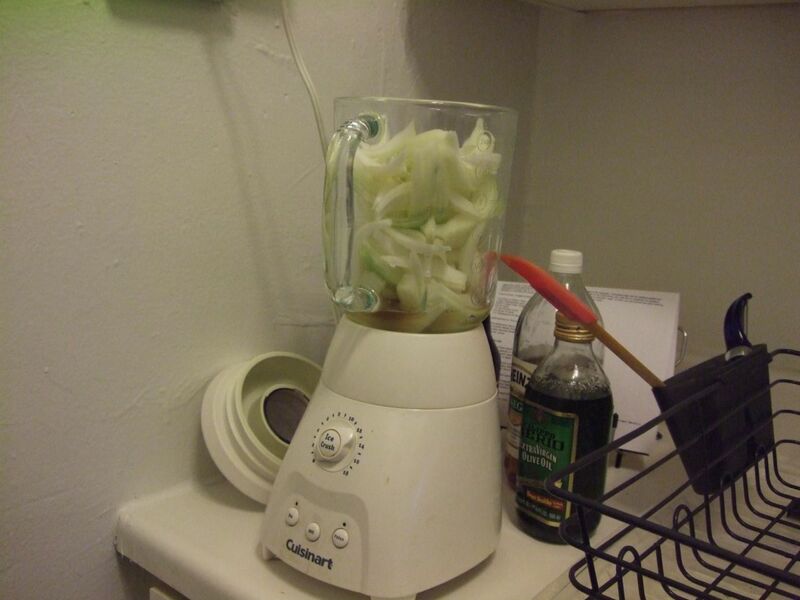 The raw onion will still be letting off some of its sulfites, so store it overnight (or at least 2 hrs) and then taste it again. 7. Store in an airtight jar in a cool, dark place, or put it in the fridge in any container. Refrigeration will help prevent separation of oil from water. Chimichurri’s shelf-life is pretty long; I’ve never actually seen it spoil, and I’ve had some jars in the fridge for months.